you may think the belt is tight, but it's still just a lil loose. you gotta wrench down on that sucker. I agree its probably alternator belt loose . mine do the same, I get tired of adjusting them. there is like a two inch long adjustment screw on the alternator bracket. Yeah be sure to check the tightness, even if you checked them not long ago. In my experiance i have had them loosen over time and needs some extra tightning. You could also use some spray belt dressing.. i cant remember what i used but it worked great for me. Please do, I too am having the squeal coming from the alternator. Yes, photo's of the correct screw to tighten please. Don't forget to loosen the hinge bolts. I snapped my ps pump adjusting screw because I didn't know to loose up the other bolts first. As the instructions say, loosen the alternator lock nut and through bolt so the alternator is free to move. Then turn the adjustment bolt to proper tension. Once achieved, tighten the through bolt and the alternator locknut. 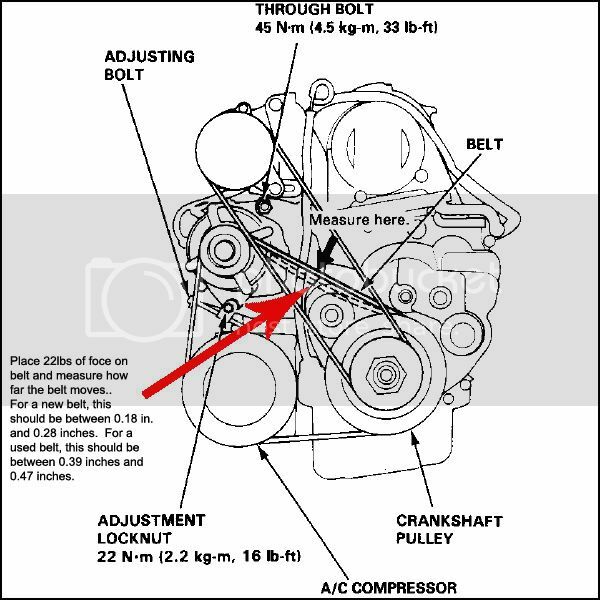 alternator belt? fan belt? power steering belt? i know it shouldnt be shaking at all but mine does quite a bit, is it in need of emergency fixing? if so what could happen if ignored.